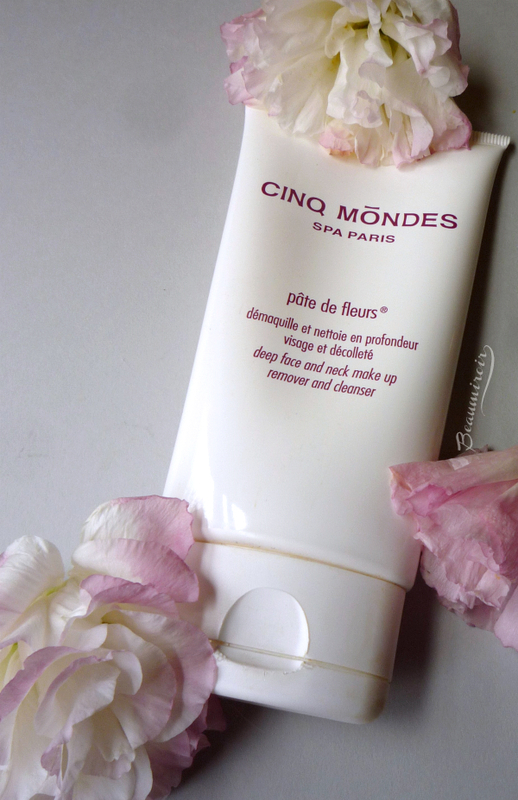 Cinq Mondes is one of the most exciting French brands of skincare and spa products you can indulge in. The brand has created a rich, evocative universe with luscious oriental beauty traditions at its core. The product range revolves around "Beauty Rituals of the World", and Cinq Mondes invites us to go on a journey along the Silk Road, an ancient trade route that connected Western Europe to the Far East, through North Africa and the Middle East. 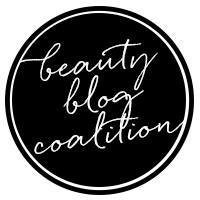 Each product line is inspired by traditional beauty recipes from a specific region of the world: there's the Atlas Ritual from Morocco, with products used in the hammam, Beijing's Ritual from China, with products containing Chinese medicinal plants, and, among others, Bali's Ritual from Indonesia, with face products containing flower extracts. All the products are formulated with high quality botanical ingredients and made to create a sensual experience just as much as to treat the skin. 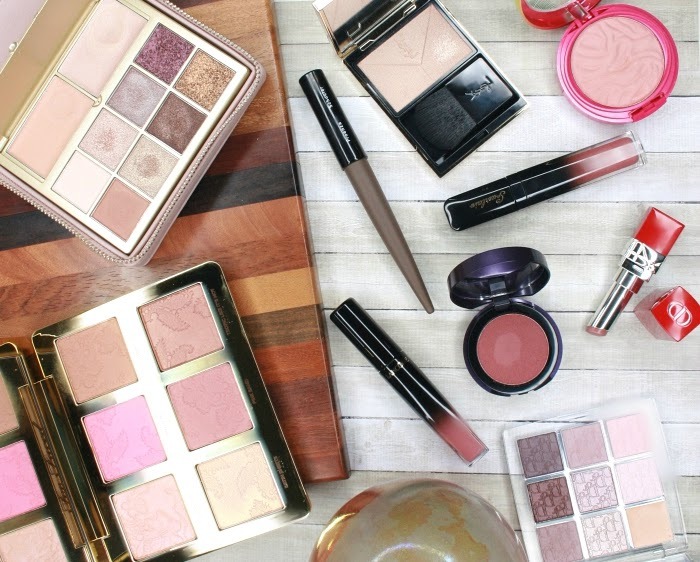 I can spend hours browsing the brand's website, dreaming about visiting one of their spas, and putting every single product in my wishlist. The only reason I don't have more of them is that as a luxury spa brand, Cinq Mondes's prices are a bit high for my tiny wallet. The product I'm showing you today is part of Bali's Ritual: the Flower Cleansing Balm is a facial cleanser and makeup remover. 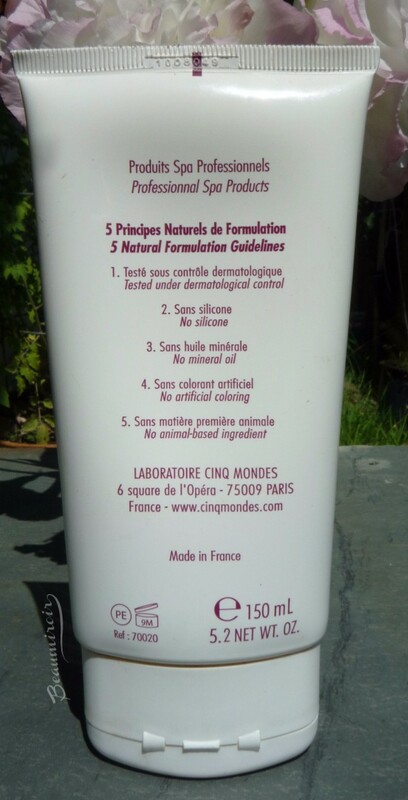 It comes in a white flat tube, typical of the brand's clean and simple design (I bought my tube in France, the ones sold in the rest of the world mention the name of the product in English too). Here's the full ingredients list: Caprylic/Capric Triglyceride, Hibiscus Sabdarifa Flower Extract, Passiflora Edulis Seed Oil, Mangifera Indica Seed Butter, Gardenia Florida Extract, Lilium Candidum Flower Extract, Ricinus Communis Seed Oil, Propylene Glycol Dicaprylate, Sesamum Indicum Seed Oil, Cinq Mondes's Own Aromatic Composition, Helianthus Annuus Seed Oil, Daucus Carota Sativa Root Extract, Cera Alba, Arachidyl Alcoholtocopheryl Acetate, Hydrogenated Castor Oil, Arachidyl Glucoside, Aqua (Water), Linalool, Citral, Limonene. As you can see, this cleansing balm is packed with flower extracts and plant butters and oils, and it contains no mineral oils, silicones or any other cheap fillers that constitute the base of most skincare products nowadays. According to the brand, the flower extracts contain mild acids that gently exfoliate, while the plant oils nourish and replenish the skin. The balm has a light, very pleasant, sweet fruity and floral fragrance. It's really subtle and absolutely not overwhelming. The rich texture feels luxurious, and it contains tiny particles of a thicker substance, that I suppose are one of the vegetal butters, suspended in the balmy base. It's a little surprising at first, but it proves useful to remove makeup: as I work the product onto my skin to dissolve the makeup, the butter particles melt slowly and help remove any residue that was left. 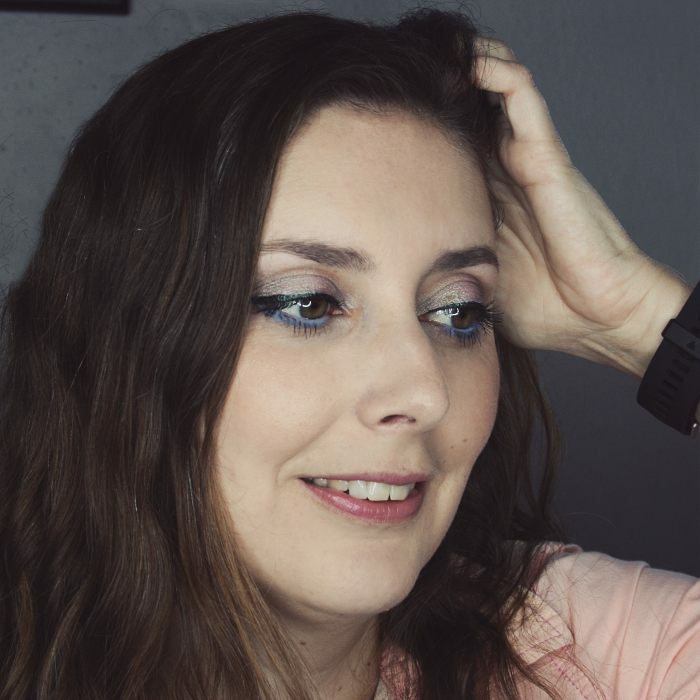 It's very efficient at removing long-lasting makeup, including mascara, but as is always the case with oil-based cleansers, it gets in my eyes and blurs my vision for a few minutes after use. It's a bit annoying but in this case, it doesn't burn (some oil cleansers do burn my sensitive eyes), and rinsing well will make the blurry veil go away. Although it feels very rich, this cleansing balm is easy to rinse off and doesn't leave my skin feeling greasy at all. It leaves it feeling clean and refreshed yet moisturized and plump. When using the Flower Balm to remove my makeup I've never had to do a "double cleansing", that is follow by washing my face using a classic gel or foam cleanser to get rid of the residue. It works perfectly well by itself! At $48 the price is steep... however I need very little product for each use, and I've had this tube forever. I reserve it for the days I did a heavier full face makeup with primer, foundation, powder and need a powerful yet gentle cleanser to take it all off. You're likely to love it if: you enjoy using cleansing oils or balms; you have normal to dry skin or you prefer non-drying, luxurious textures; you want your products packed with plant extracts and avoid mineral-oil based products. It might not be for you if: you have oilier skin and/or prefer to use oil-free products. 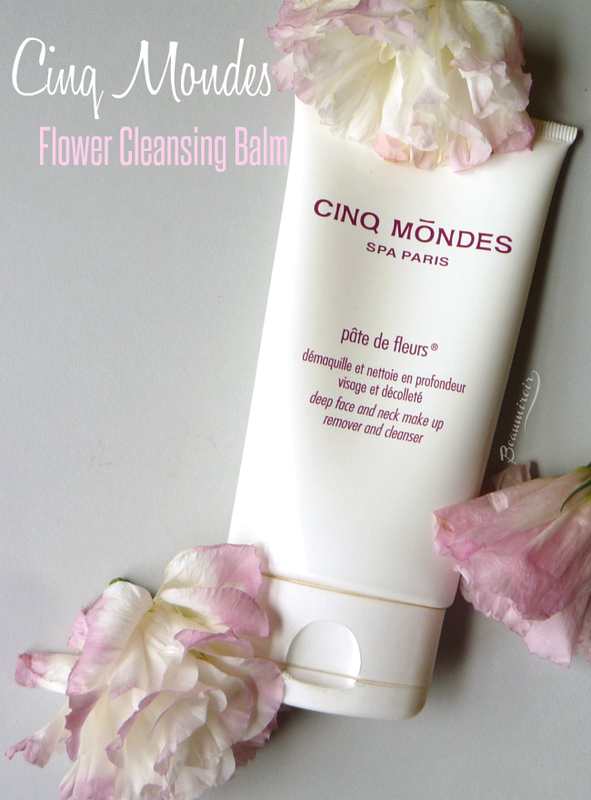 Overall: Cinq Mondes Flower Cleansing Balm is lovely product that flatters my senses with its subtle scent and luscious texture, and still does a great job at removing heavier makeup. Highly recommended if you want to indulge in a luxurious spa product. Where to buy: in the US, Dermstore carries the brand. There's also a Cinq Mondes Spa in Carmel, CA, that I dream of visiting. Sounds very luxe indeed! Nice. The good thing here is that the high price tag seems justified by the good quality of the ingredients, at least in my opinion! Honestly I hadn't paid attention to the ingredients before preparing the review, and it just made me love this cleansing balm more. Never heard of this brand before. Love the fact that there are no silicones in it! It's a great brand to discover. As far as I know they don't use silicones in any product! I don't think I have ever seen this brand when I was in France, but I probably just didn't know what to look for. Let´s see if I can spot it next time I am in France. It's sold in spas and specialty stores but not in the big retailers stores like Sephora or Marionnaud.